Islamic State jihadists use children, trained as soldiers, executioners and suicide bombers from an early age, to become “more lethal fighters than themselves,” a major study has warned. The terrorist group is using Nazi regime tactics. “The organization focuses a large number of its efforts on indoctrinating children through an extremism-based education curriculum, and fostering them to become future terrorists. The current generation of fighters sees these children as better and more lethal fighters than themselves, because rather than being converted into radical ideologies they have been indoctrinated into these extreme values from birth, or a very young age,” researchers for Quilliam, a London-based counter-extremism think tank, stated in the report, according to the Guardian. The UN-endorsed report, entitled “Children of Islamic State" and compiled through a study of the group’s propaganda as well as reports from trusted sources, will be published in Parliament on Wednesday. Of more than 800 Britons living in Islamic State-controlled territory, an estimated 50 are said to be children. Researchers investigated how Islamic State (IS, formerly ISIS/ISIL) recruits children and trains them for jihad. In the past six months, IS propaganda has featured 12 child killers. According to the researchers, between 1 August last year and 9 February this year, they identified a total of 254 events or statements featuring images of children. In an effort to put brutality into their daily routine, the group encourages youths to hold up decapitated heads or play football with them. IS uses intimidation as a recruitment tool, warning that those who refuse to obey will be tortured or raped. According to the report, the focus on children is similar to the forced recruitment of child soldiers in Liberia in the 1990s, when Charles Taylor, one of the most prominent warlords in Africa, seized power in 1997 with a rebel army filled with children. Researchers also mention the Ashbal Saddam (Saddam’s Lion Cubs) created in 1998 to recruit and train boys aged 10 to 15 for membership in the Fedayeen, a paramilitary organization loyal to the Ba'athist government of Saddam Hussein. IS appears to have scrutinized Nazi Hitler Youth methods to brainwash children, the report said, adding that the UN had received some reports about an Islamic State youth wing, Fityan al-Islam, meaning boys of Islam. Recruitment of children often involves coercion, with abduction being a favored method, according to the report. The United Nations said earlier this year it had information about the murder of child soldiers and had verified reports suggesting between 800 and 900 children in Mosul had been abducted for military and religious training. The report’s authors suggest creating a commission to help monitor and reintegrate children within the EU who are at risk, and to protect future generations from radical violence. Life under IS is “one of the gravest situations for children on Earth," a spokesperson for the Roméo Dallaire Child Soldiers Initiative, which co-wrote the report, told the Guardian. Less than a month ago, IS released a new disturbing clip showing a British boy, nicknamed 'Jihadi Junior' and thought to be aged four, blowing up three prisoners. The child wearing an IS headband is seen pressing a button on a remote control device seconds before a car containing alleged “British spies” explodes. IS teach boys as young as three jihadist ideology, how to handle firearms, beheading techniques and how to be a suicide bomber, a journalist who risked his life to visit a children’s militant camp in Afghanistan told RT in December. “All the children knew all the names of the weapons and they all knew how to use [them]..." filmmaker and journalist, Najibullah Quraishi, said. 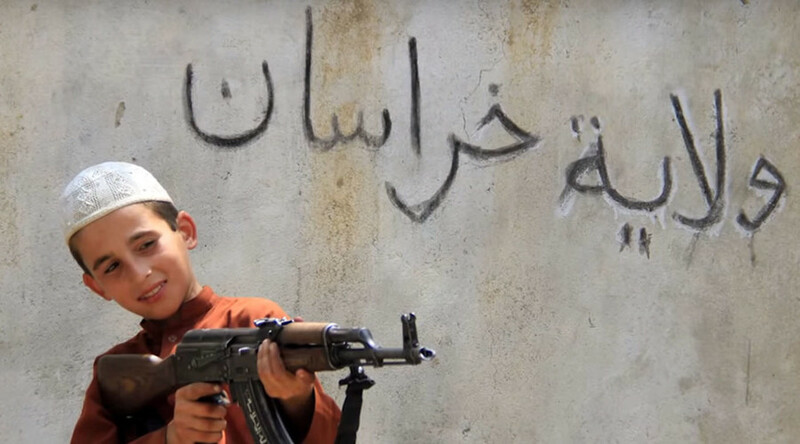 Afghan children appear to be the latest to be recruited by IS terrorists, who have implemented similar brainwashing programs in Syria and Iraq.